My caption: Vance Palmer, about 15 years old. Unknown coal mine in Harrison County, West Virginia, September 1908. Photo by Lewis Hine. Lewis Hine caption: Vance, a Trapper Boy, 15 years old. Has trapped for several years in a West Va. Coal mine. $.75 a day for 10 hours work. All he does is to open and shut this door: most of the time he sits here idle, waiting for the cars to come. On account of the intense darkness in the mine, the hieroglyphics on the door were not visible until plate was developed. Location: West Virginia, September 1908. On December 6, 1907, less than a year before this photo was taken, the worst mining disaster in American history occurred in Monongah, West Virginia, not far from where Vance Palmer was born and raised. An underground explosion at the Consolidated Coal Company resulted in the deaths of 362 men and boys, leaving 250 widows and over 1000 fatherless children. Young Vance had a lot of time on his hands in his lonely job, and he must have thought about that mine disaster more than once. 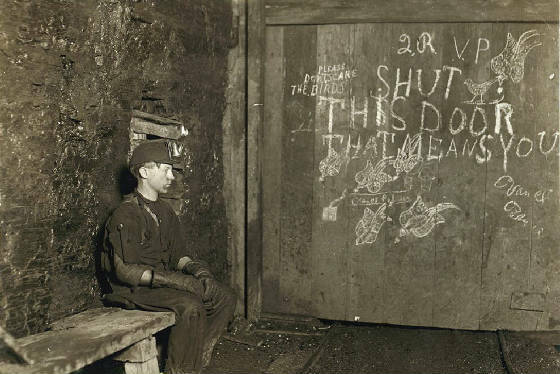 This is one of those photographs by Lewis Hine that stop you dead in your tracks. I opened up the Library of Congress website one morning, started browsing the child labor photos, and saw it. I couldn’t do much the rest of the day except search hour after hour for information about the boy, whose last name was not included in the caption. But when I blew up the photo, I noticed that he had scrawled what appeared to be “Vance Palmer” on the door several times, and as well as the letters, “V.P.” So I searched Vance Palmer in Ancestry.com. I found him right away in the 1920 census, listed as a 26-year-old glass cutter, not married. He was living near Clarksburg. In the 1930 census, he was married to Helen and had three children: Vance J., Eloise and William. He was still a glass cutter. I also found his WWI and WWII draft registrations, which identified his full name as Vance Swisher Palmer, born September 16, 1893. He turned 15 years old in the month he was photographed by Hine. Two days later, I got in touch with a historian in Clarksburg, West Virginia, who sent me a copy of his official West Virginia death record. He died August 20, 1945, at the age of 52. The historian knew his family and got me in touch with Vance’s daughter, Eloise Jurick. I called her and sent her the photograph. She had never seen it. Finally, I interviewed both her and her brother William, who also had never seen the photo. Vance was born to George Palmer and Celia McGready, who married in Harrison County, West Virginia, in 1870. They had at least 10 children, Vance apparently the youngest. In 1904, George remarried, this time to Atha Carder. Celia did not die until 1923, so it appears that she and George divorced. There are conflicting records as to whether George and Atha had any children. George died in 1915, and Atha married again. She died in 1935. In 1908, when Hine photographed him, Vance may have been living with his mother, or perhaps with his father and stepmother. He does not appear in the 1910 census. Edited interview with Eloise Jurick (EJ), daughter of Vance Palmer. Interview conducted by Joe Manning (JM) on May 9, 2007. JM: What did you think of the photo of your father? EJ: I appreciated it very much. I immediately contacted both my brothers about it. One of them said he knew that my dad had worked in the mines, and that he didn’t work there very long because he didn’t like it. JM: How many children did he have? EJ: There were four of us, three boys and a girl. George was the youngest. JM: One of your brothers was also named Vance. EJ: He was the oldest. He was in the Merchant Marine. 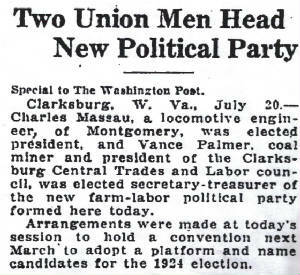 EJ: 1925, in Clarksburg. That’s where I was raised. JM: Did your father always live in Clarksburg? EJ: Well, he lived all his life in the area, but not always right in Clarksburg. He died in Clarksburg. JM: I found out that he worked for the Pittsburgh Plate Glass Company. What did he do there? EJ: He was a glass cutter. He worked during the day. I never knew that he chewed tobacco until one day when I happened to see it in his pocket. I asked him what it was for, and he said he chewed it while he was cutting the glass so he could keep the glass fragments out of his throat. JM: Did he get promoted to other positions at the company later? EJ: He was always a glass cutter as far as I know. JM: Did your parents own the house you lived in? EJ: Yes. We had a farm. It was on an acre of ground, and then Dad bought another 15 acres that was used for cattle and a horse. JM: Did you live close to the factory? EJ: About three or four miles at the most. EJ: No, but she did some of the farm work and gardening. EJ: Helen Behres. She was from Ohio. JM: Your father was quite young when he died. EJ: Yes, he died in 1945. EJ: My father was a very nice person. He loved his family very much. We are Catholic, but he was not. He saw to it that we lived near the Catholic church, and that we got to Mass every Sunday. He sent us to a Catholic school, and he drove us to school before he went to work. JM: I have information that indicates your father was involved in union activities. EJ: That’s right. He was very interested in the union. And he liked to help poor people. In fact, he and another man had a place where they would help the poor. JM: What did your father enjoy doing when he wasn’t working? EJ: He loved to hunt. And he loved to travel. We went on quite a few family trips. We would drive up to Washington and Virginia and in the Blue Ridge Mountains. Edited interview with William Palmer (WP), son of Vance Palmer. Interview conducted by Joe Manning (JM) on December 6, 2007. 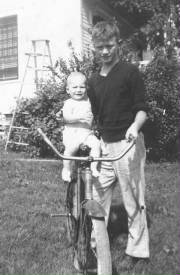 William Palmer and baby brother George, circa 1944. Photos provided by Palmer family, except where noted. 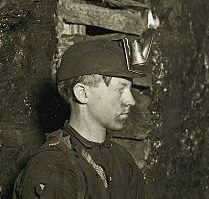 JM: What did you think of the photo of your father in the coal mine? WP: I knew he had to work when he was young, but I didn’t know he worked at the mine. I remember him telling me that he went down in the mines once and said he would never work there. JM: He looked awfully bored in that picture. WP: Well, he had to sit there all day and do nothing but open that door. But he still looked dirty like he had been in the mine. WP: 1930. I grew up on my family’s farm. JM: So your father had to go to work and then come home and work on the farm? WP: Oh, yes. There was a lot of work to do. We even raised our own corn to feed the chickens. JM: Where else did your father work? WP: He worked for Pittsburgh Plate Glass, then he worked for Roland Glass Company, also called Fourco, and then back to PPG. With Fourco, you went down there each day and got in line to see if there was work. Dad has so many cuts and nicks on his hands, that he developed lots of calluses. He cut large sheets of glass, about 4′ x 7′. They weighed 50 pounds. He cut them with pieces of 6-point diamonds, worth about $3.00 each. JM: What kind of house did you live in? WP: It was a nice house. It was two stories, with a kitchen, a living room and a dining room. We didn’t have a bathroom, and we had no water, and no electricity. We had gas lights. We had an outside toilet. In the mid-1930s, the WPA came around the area and put new toilets in for a lot of people. So we got a brand new outside toilet. We thought we really had it made. JM: When did you get electricity? WP: About 1940. We had a pump on the back porch, so we pumped our own water. After we got electricity, we went up on the hill above our house and drilled a well and put in an electric pump. But we had a cistern that the birds would get into, so we really didn’t drink from that. We’d use that for bathing or washing clothes, and drank the water from the old pump. WP: 1920. My mother was from Ohio, right across the river from Wheeling (West Virginia). She was born in 1899. She graduated from high school about 1917. She had relatives that she visited in Clarksburg, and my daddy was renting a room from them. So that’s how they met. JM: I found some interesting information about your father. I found his WWI draft registration. WP: He trained down in the Carolinas. He finished his training and was on the boat that was ready to leave to go overseas when they said the war was over. So he never went overseas. JM: The 1920 census lists him living in Point Comfort. WP: That was part of Clarksburg. There were a lot of coal mines in Point Comfort. JM: Your father died in 1945. WP: Yes, he was only 52. JM: Was he still working for PPG then? WP: Yes, he was. When he died, my brother George was only two years old, and I was just 15. At that time, my older brother was out to sea in the Merchant Marine, and my sister was working in Washington, DC, for the Army Map Service. When I was 16, I went to work at PPG. I was an apprentice glass cutter. I really didn’t bring much money home. I graduated from high school in 1948. About that time, the factory had to repair the tanks, so they didn’t have any work. They needed glass cutters in Henrietta, Oklahoma, so I went there to work. JM: After your father died, how did your mother get by? WP: The house was paid for. My mother was getting $37 per month from Social Security, and $18 a month for each of the children, until they reached 18. She got $5,000 life insurance that she put in savings bonds and divided it among the children. I sent some money home when I was working in Oklahoma. She had a little garden. We had 15 acres. My brother wanted to build a house on one acre, but he never finished it. About 10 years after my father died, someone bought the unfinished house and 13 more acres from my mother. JM: How did you wind up in Texas? WP: PPG Industries was going to shut down the factory. I was a supervisor there. Out of all the 50 or 60 supervisors they had, I was one of the ones they didn’t lay off. They offered me a good job in Texas. That was 1974. JM: Lewis Hine took your father’s picture because he wanted to help get child labor laws passed so children wouldn’t have to work. Do think it was wrong that your father had to work in the mine at such a young age? WP: Yes, it probably was, but it wasn’t unusual. During the war, we had a neighbor who couldn’t get any help to get his hay put up. One day, my dad and I were hauling potatoes. I was just 12 years old then. So the neighbor walks over and asked us if we wanted to put his hay up. So my dad agreed, and we made 25 cents an hour. His wife cooked us supper. Boy, you talk about a supper. She put quite a supper on that table. We worked for several days over there, and the guy almost worked me to death. We got done, and he paid my dad, and my dad says, ‘Are you gonna pay my son the same?’ And he said, ‘Sure, he worked as hard as anyone.’ I had a bunch of money, probably about fifteen dollars, but I thought I was rich. JM: Your father had to work in a coal mine when he was a boy, he had to struggle through the Depression, and then he died when you were just a teen. But you’ve apparently gone far in your life. WP: That’s because I was raised well. During the 1930s, things were tough. There were times I know my parents didn’t have any money. But we always had plenty to eat, because we raised a lot of it. We had a cow. One time, the cow went dry. So my dad kept track of the money he had to spend for milk, while the cow was dry. He said, ‘I could’ve bought another cow with that money.’ So he went to the stockyards. It was seven miles over the hill. He bought another cow, but he didn’t have any way to haul it home. So this young boy had to walk it home. I put a rope around that cow’s head and walked it back. 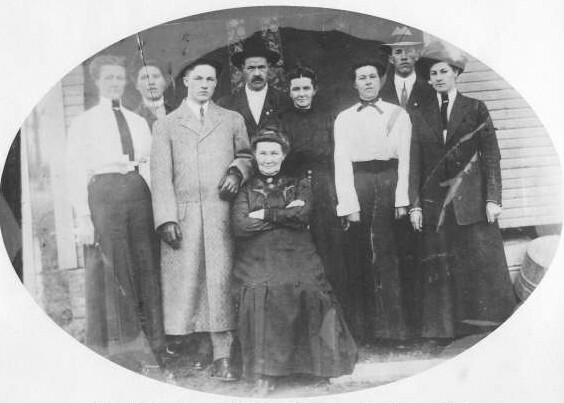 Children of George and Celia Palmer (L-R): Eva, Bertha, Vance, William, Elizabeth, Susanna (called May), Upton, Della; mother Celia seated in front. 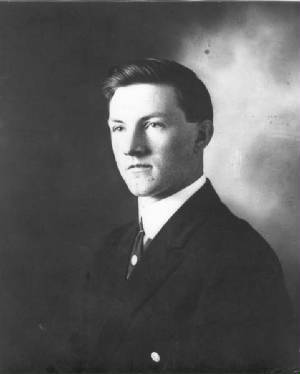 Vance Palmer, possibly a school picture. 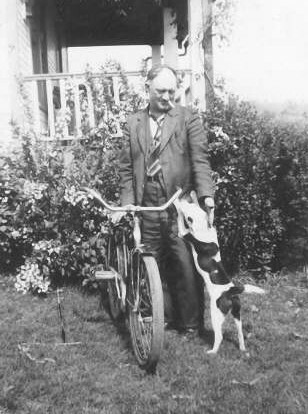 Vance Palmer and his dog Sluefoot, Circa 1945. Vance Palmer, 1908. Photo by Lewis Hine.